At Western Oregon University, helping students achieve academic success is always at the top of our priority list. Thanks to our many great major and minor programs, you get to decide where you want your college degree to take you in the future. WOU offers several bachelor’s (four-year) degrees – bachelor of science, bachelor of arts, bachelor of music and bachelor of fine arts – as well as certificates, advanced baccalaureates, master’s degrees and pre-professional tracks. Explore the pages below to find out what you might like to be when you grow up. American Sign Language Studies, B.A. Deaf and Hard of Hearing Education, M.S.Ed. Education, Early Childhood Studies (Non-Licensure), B.A./B.S. Management and Information Systems, M.S. Public Policy and Administration, B.A./B.S. Interested in a career in one of these categories? Check out these majors, minors, and certificates. Student Success and Advising engages students in identifying and pursuing their educational, career, and life goals through personalized learning experiences. 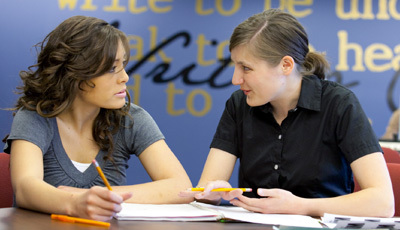 The SSA serves and supports students in developing collaborative relationships that foster student success. 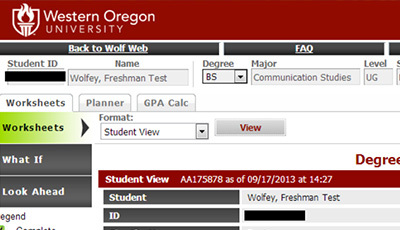 Once enrolled, WOU students use the online DegreeTracks system to monitor progress toward their college degree. Current students follow this icon in the Portal to explore options and see what’s next.